Current applications are eager to acquire and consume more and more amounts of data coming from distributed heterogeneous devices and sources, specially for IoT and mobile applications. As a developer you need to deal with data in an effective, fast, agile, and secure manner. The truth is that edge nodes, only in combination with cloud services, can provide the benefits of both worlds: better bandwidth, latency and security; and reliability and scalability levels required by such Data-Intensive Applications (DIAs). 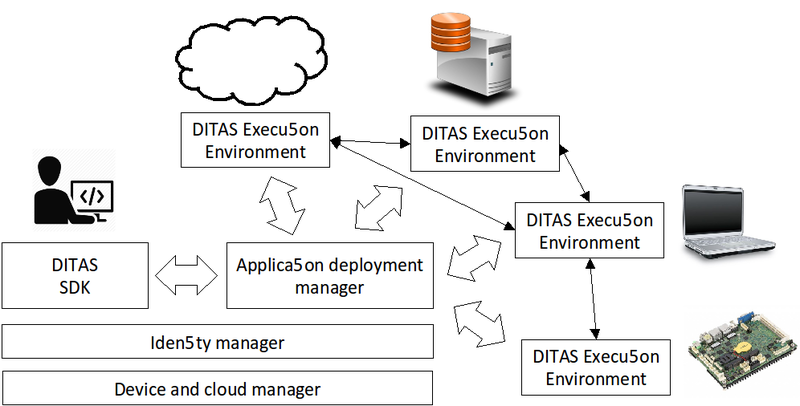 DITAS Cloud Platform allows developers to design data-intensive applications, deploy them on a mixed cloud/edge environment and execute the resulting distributed application in an optimal way by exploiting the data and computation movement strategies, no matter the number of different devices, their type and the heterogeneity of runtime environments. It brings to your developer toolbox the best of Cloud & Edge worlds. The DKMS group is involved mainly in the concepts of the Data Virtualization. Its role is the definition of the concept of the Virtual Data Container, that will provide a virtualized access to data coming from various and heterogeneous data sources, exploiting the inherit attributes of each source, as defined by the work to be carried by other components of the platform. It will also provide a common access framework for discovering and retrieving data by exploiting a common query language. Moreover, it will lead the task of clustering and performance characterization of target applications against specific performance stereotypes, that will be served as a valuable input to the elastic mechanisms of DITAS in order to scale the application components efficiently. Finally, it will take advantage of its leader role in various european research projects in order to lead the task of collecting, formalizing and defining the user requirements of both a technical and business perspective.